Russia conducted a live-fire military exercise in the Baltic Sea on Wednesday, forcing the partial closure of sea and airspace for some countries, the Washington Post reported. 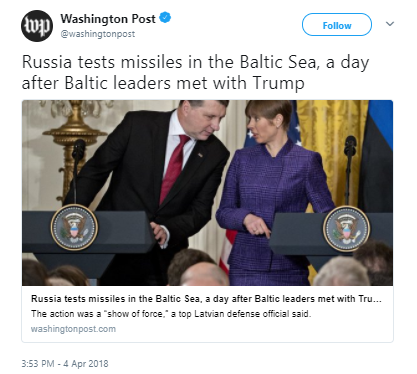 Russia tested live munitions during the three-day missile test in Latvia’s exclusive economic zone in the Baltic Sea, as well as other western parts of the Baltic Sea. Latvia said drills have never been conducted so close to its territorial waters. “Drills lasting for three days in the region where there is very intensive aviation traffic, and given everything else that is happening in relations between the West and Russia, I think that it is a rather provocative action,” Latvia’s ambassador to Russia, Maris Riekstins, told Latvian Television, Reuters reported. Sweden also issued warnings to civilian air and sea traffic and closed off some travel lanes until the military exercise ended. Russia’s Baltic Fleet based in the Kalinigrad exclave performed the exercise. The exercise comes just one day after the presidents of Latvia, Lithuania and Estonia met with President Donald Trump at the White House. Trump applauded the Baltic countries for spending at least two percent of their GDP on defense. “I especially want to commend the Baltic nations on meeting their defense spending obligations this year for NATO, unlike some of the other countries, frankly, that haven’t met their obligations, but they will,” Trump said, the Washington Post reported. Last September, Russia conducted massive military exercises in the Baltic region, raising concerns from Western countries.